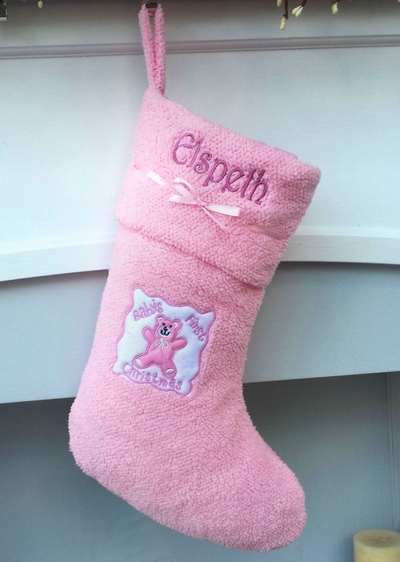 Truly exceptional baby's first Christmas stocking - pink for girls made out of the very softest, cuddliest micro fleece with fine applique of a teddy bear and Baby's First Christmas with a pink satin ribbon. The final touch of quality and luxury is added by pink inside lining. Measured 19 inches along the diagonal from the top of the cuff to the toe, and is 7 inches wide across the cuff. Materials: Designed with the highest standards luxury materials. The outside is made from the micro fiber softest terry you can imagine. You know, the kind of material you want to hold and cuddle because it feels so good to touch. Soft felt teddy bear applique. Satin Ribbon weaved through the cuff. Lining: YES. Inside lining is also in satin material that matches the outside color palette.